Where to start? Arbitrarily, here … After several terrorist attacks and a declaration of war by Osama Bin Laden, President Bill Clinton lobs a couple of cruise missiles into Afghanistan and hits a pharmaceutical building. Fast forward … 4 hijacked airliners crash into various places in the US killing 3,000 people. Right then & there, I vowed I was done with Democrats and regretted my vote for Bill Clinton. I had already skipped my one & only ever Presidential election. Just couldn’t pull the lever for either Al Gore or George W. Bush. From this day forward, I became a most respectful man toward our relatively new President Bush. I would vote for him in 2004. Faced with one of the greatest massacres in American History – and on our own soil – Bush responded with the Wars in Afghanistan, and, later, in Iraq. It should be remembered that the 2nd was entered into with bi-partisan support. Of course, later with 20/20 hindsight, the catchy little phrase, “Bush lied; people died,” became trendy among the Democrat left in this Country. There was no lie, but what does that matter? World-wide faulty intelligence was to blame. End results were, however, that Bush won 2 wars in Iraq … first against the Iraqi Army, in short order, capturing Saddam Hussein in the process, and then, an unexpected war against the insurgency, otherwise known as al- Qaida in Iraq. By the time our current President Obama took office, things were pretty much under control. Obama & his VP, Joe Biden, would later claim that Iraq was stable and would go down in history as one of the Obama Administration’s greatest achievements. Yes, they really said that … and more. At that point, Iraq became Obama’s War. And then, as promised, Obama had our military withdraw from Iraq. No doubt in my mind he could have reached an agreement with Iraqi leaders to leave a substantial, stabilizing force behind, but it was not to happen. Thus, a nice little power vacuum. And so was born The JV. Meanwhile, Hillary had her little “reset” stunt with Russia go awry. Arab Spring was a mirage. Israel has been alienated at every turn. Despite the left’s gurgitations about no more nation building., we take out Khadafy in Libya and create the next tumultuous state. 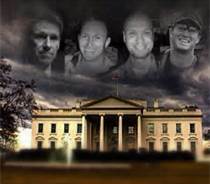 Remember Benghazi! The Taliban is resurgent in Afghanistan. And Syria became a bloody mess, partially exacerbated by Obama’s infamous do-nothing “red line.” Oh, and, the growth of the Islamic State, ISIS, or, ISIL, or, their proper name, The JV. I mean, is this all a bad joke? Suddenly, 1 — yes, that’s ONE – hour prior, a Russian general informs us in Bagdad that Russian airstrikes will begin in Syria and we had better get out of the air. One freakin’ hour. Fairly humiliating, I would think. So, Syria is a complete mess. Thanks, Obama. Migrants, refugees, whatever you choose to call them are streaming northward and westward by the millions. What to do? A lot of fingernail biting, I guess. And here I go forgetting all about that sad sack of a nuclear arms deal with our new “friends” in Iran. What now looks like an unholy alliance forming in the Middle East – Russia, Syria, Iraq, and Iran – makes a hot bed a Hell. Thanks again, Obama. I suppose we just have to wait and see. Have fun, Next President! Now, I know, I am no Middle East expert … I may be, according to some of my “critics”, a bigot, a racist, a homophobe, an Islamaphobe, a close-minded ignoramus, a worthless piece of s—t, and, most recently, a paranoid schizophrenic. Take this all with a grain of salt. Perhaps, the cradle of civilization is one big Nirvana. Jimmy Carter [D] — On November 4, 1979, Iranian militants stormed the United States Embassy in Tehran and took approximately seventy Americans captive. Bill Clinton [D] — On February 26, 1993, WTC in NYC attacked by a powerful truck bomb killing 6 and wounded over 1000. Bill Clinton [D] — On June 25, 1996, 19 American soldiers killed by a truck bomb in Saudi Arabia. Bill Clinton [D] – On August 23, 1996 Osama bin Laden declares war on the US via the Declaration of Jihad Against the Americans Occupying the Land of the Two Holy Mosques. Bill Clinton [D] — On August 7, 1998, US embassies attacked in Tanzania & Kenya, killing 200 including 12 Americans. afterwards, US strikes back with cruise missiles with little effect. Bill Clinton [D] – On October 12, 2000, the USS Cole was attacked in Yemen killed 17 sailors and wounding another 39. Bill Clinton [D] – On September 10, 2001, Clinton said, “I’m just saying, you know, if I were Osama bin Laden … He’s a very smart guy. I spent a lot of time thinking about him. And I nearly got him once. I nearly got him. And I could have killed him, but I would have to destroy a little town called Kandahar in Afghanistan and kill 300 innocent women and children, and then I would have been no better than him.” On September 11, 2001 – in large part because of Clinton’s inactions & failures – 3000 people were killed in NYC, Washington D.C., and Pennsylvania. George W. Bush [R] — On October 7, 2001, the US launches its first serious retaliatory strikes against the Taliban & al Qaeda beginning the war in Afghanistan. Later, with huge bilateral support, the US attacks Iraq, quickly dismantling the Iraqi forces and capturing Saddam Hussein, before being bogged down with an insurgency. A successful military surge was implemented in 2007 – 08. Barrack Obama [D] – 2009 – 11, authorizes huge troop withdrawals from Iraq directly contributing to the widespread growth of ISIS, who he routinely underestimates, and loss of most of the gains achieved by the surge. Barrack Obama [D] – to Present – well, just pay attention to the news.